Hello, faithful readers… and welcome to the final hours before winter vacation. You see, I am packing up and shipping out to warmer regions far-flung—a Christmas present to myself of sorts. Going to do a little bit of sight-seeing and a whole lot of nothing. So, in honor of the trip, I am posting this noble giraffe. 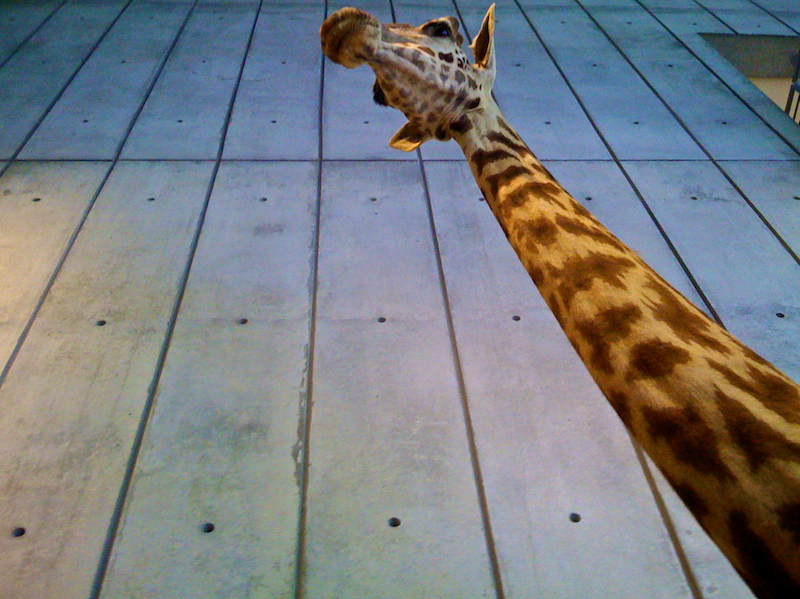 The snapshot was taken at California Academy of Sciences in the main lobby. I was frankly taken aback by how tall this little guy was. At 6’2″ I am not a shorty by any means, but to get this view, I had to hold my camera up as high as I could (no zoom on the iPhone) and push the button. And still, he gazes down on me as if I were but a bug. I wonder if they ever get afraid of heights? Nevertheless, that about does it for me today. Gotta get packed and ready to fly. But in the meantime, what are y’all planning to do for the new years? Anything exciting? Leave ‘em in the comments section below!